KIEV, Ukraine -- Women's rights groups have filed suit against the Ukrainian prime minister in a Kiev court for saying that government reforms are not "a woman's business," their leaders said Thursday. Prime Minister Mykola Azarov, who heads an all-male Cabinet, made the remark during a speech last month. 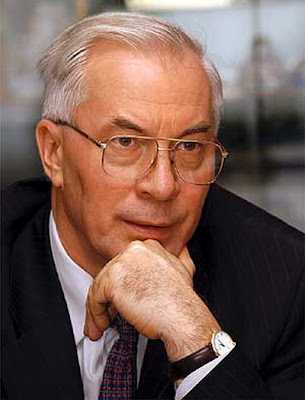 After criticism from female politicians at home and abroad, Azarov explained that he meant he would not wish any woman, especially if she has children, to work more than 15 hours a day as his ministers do. Kateryna Levchenko of the rights group La Strada Ukraine described Azarov's statement as a "direct discrimination against Ukrainian women and me personally." She said she filed the suit Monday. Olena Suslova, the head of another rights group, Women's Advisory Center, has filed a similar suit. Court officials refused to comment. Last month, dozens of female activists of the local FEMEN human rights watchdog held a protest in front of the Cabinet, demanding posts for women in the government. Police detained one as she started pulling her clothes off. Ukraine's new Cabinet is considered Europe's biggest with 29 ministers.